How refreshing! 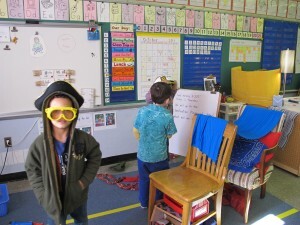 To read about a kindergarten class immersed in choice time with children figuring out what they want to do and doing it: even if the ‘it” involves a choice to not really think! But what struck me most about this entry was the variety of options that these students have. Seems like Bill isn’t afraid for things to get messy and complicated. He’s not afraid of student voice and conflict and he appears open to the challenge of 24 five years olds exploring and playing. I love the idea of just working with black and white and am curious how Bill decides what to make available for his young students. 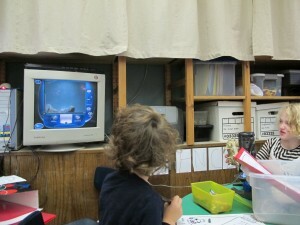 Thanks for documenting this kindergarten classroom. Thanks for your comments, Anna. I set out to make this a year of exploration for myself as a teacher – and with Renee’s help lots of things have begun to percolate. It’s always invaluable to have a second opinion and a fresh set of eyes to look at the way you have been approaching your teaching. First, there were the changes to the classroom layout – just some simple suggestions, but what a difference they made! 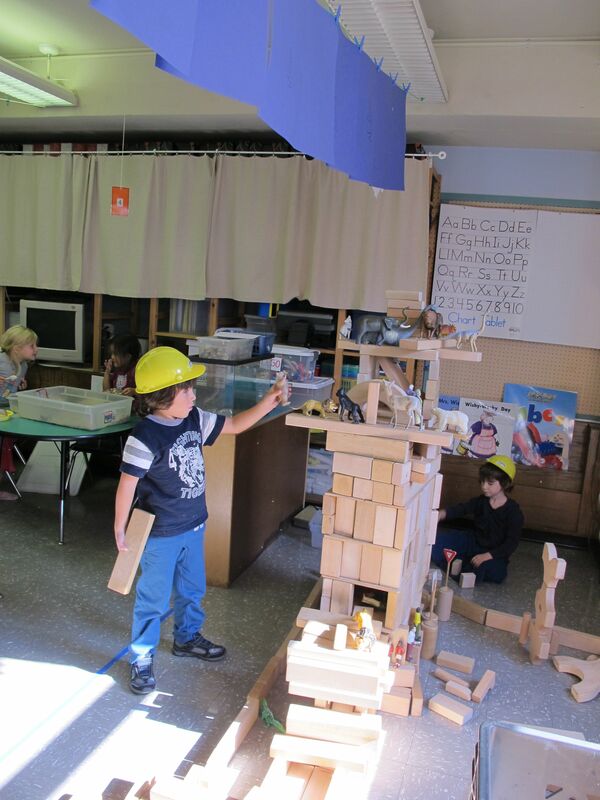 When other teachers saw the way Renee and I set up the block and dress-up areas they tried it out for themselves and they are reporting the same changes we have seen – namely, that children now use the spaces in more creative and engaging ways. Another very simple idea: In the past I always had eight basic centers – blocks, dress-up, writing, math, art, drawing, science, and library – and I would try to fit various curricular activities into those centers (i.e. 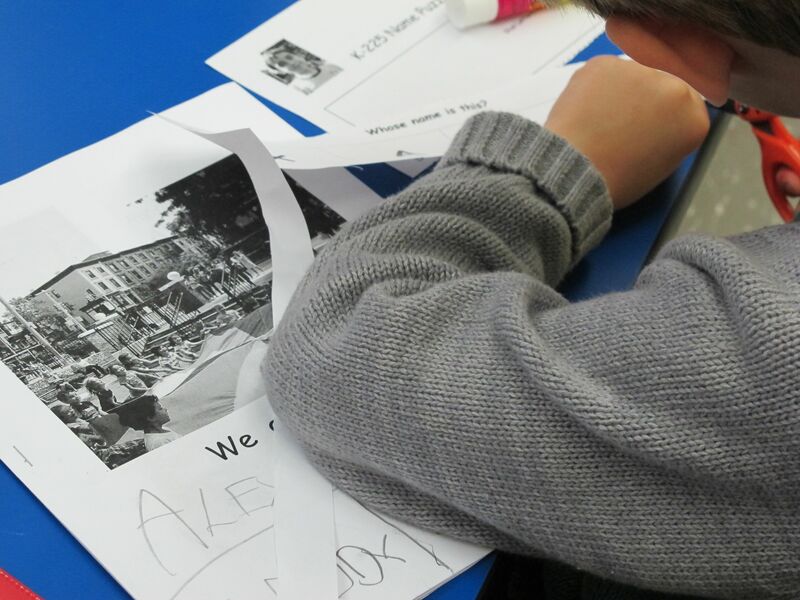 : when the class was engaged in a name study, I would place name study activities in the writing center as an alternative to writing papers and booklets). I was often disappointed when children failed to “take the bait” and they chose the familiar over the new. Now, I simply create a new center that is named for the activity I want children to practice and the “newness” of the center draws children in right away (thus, we now have a “Star Name” center that will last for only a few weeks). This approach to creating new centers is working out well and it encourages me to be more flexible in my choices for new centers. Ideas for centers can come from both the curriculum and from the children. 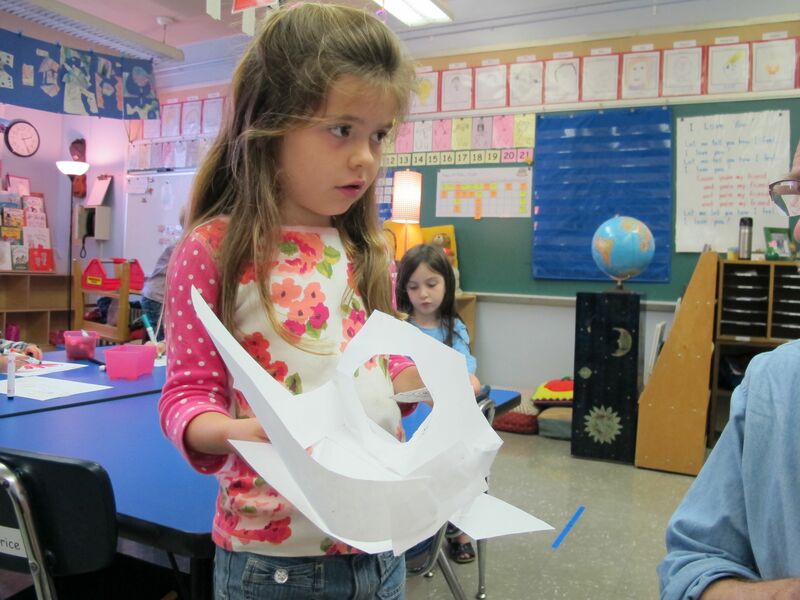 When Sophia created a “pop-up playground” out of cut paper in the art center one day, we immediately opened a “Pop-up Playground” center the next (with Sophia as the instructor). All I really needed to do was assemble a basket of scissors, glue sticks, and tape and make a little sign for the choice time chart. 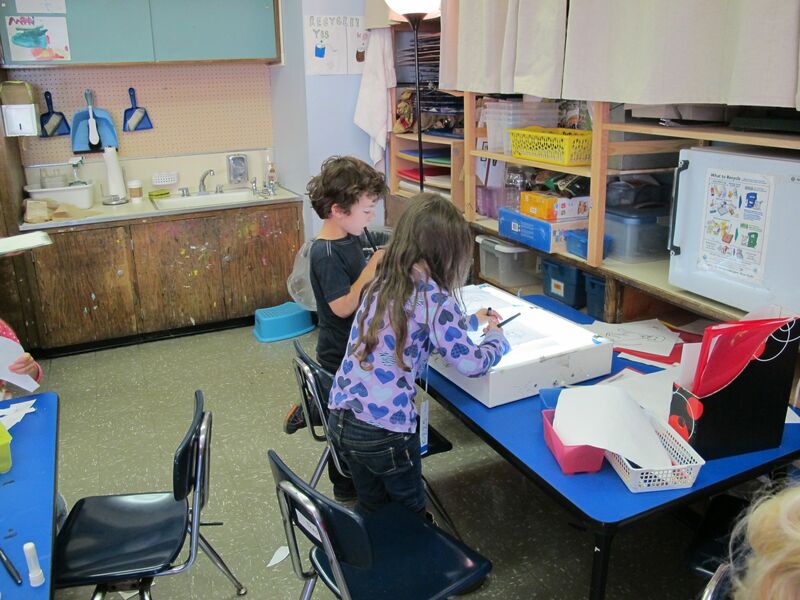 As a result of our ongoing debate about light box uses, I am rethinking the drawing center. 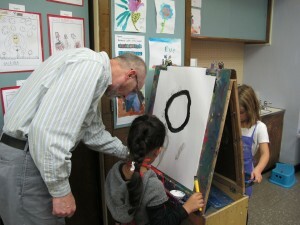 My main objective in this center has always been to offer an activity that improves eye-hand coordination. I see it as a pre-writing activity rather than an art activity. Far from having their minds disengage, though, this activity requires a kind of super concentration – the result of which is that the language portion of the brain becomes quiet while the eyes and hands do their work (current research into brain activity suggests that the language center of the brain – the “talking to yourself” part – may, in fact, have a far less important role in our behavior than we might like to believe). 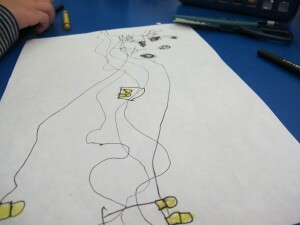 For this reason I will continue to offer tracing activities, but the light box is a wonderful tool for exploration. I have often observed children experimenting by bringing materials from the art and science centers over to the box. Perhaps what I need is a second light box! Or maybe a light box in the science, art, and drawing centers! To answer the question about paint choices in the painting center: a few years back, Connie Feniccia, our Studio in a School art teacher, shared her painting curriculum with us. In it, children are introduced to painting first with black and white paints, then the primary colors are added to the selection one at a time (currently, the children are using black, white, and red in my classroom – next red will be substituted with blue, etc). 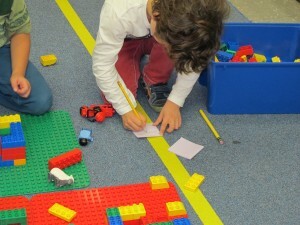 In this way, the children get to experiment with a range of values for each of the primary colors. They also learn how to clean the brush (only one brush is used and must be cleaned between colors) and mix paints on the paper. It takes about six weeks before the kids have a full compliment of colors – red, yellow, blue, black, and white – but by that time they know how to mix any color they want. After all colors are introduced, can children then choose to return to black and white and maybe red? The palette and technique can always vary. How long is choice time in your room? And what are the rules about sticking with a choice, etc? After all the colors are introduced, I rarely see children return to monochromatic painting, though it is always a choice. 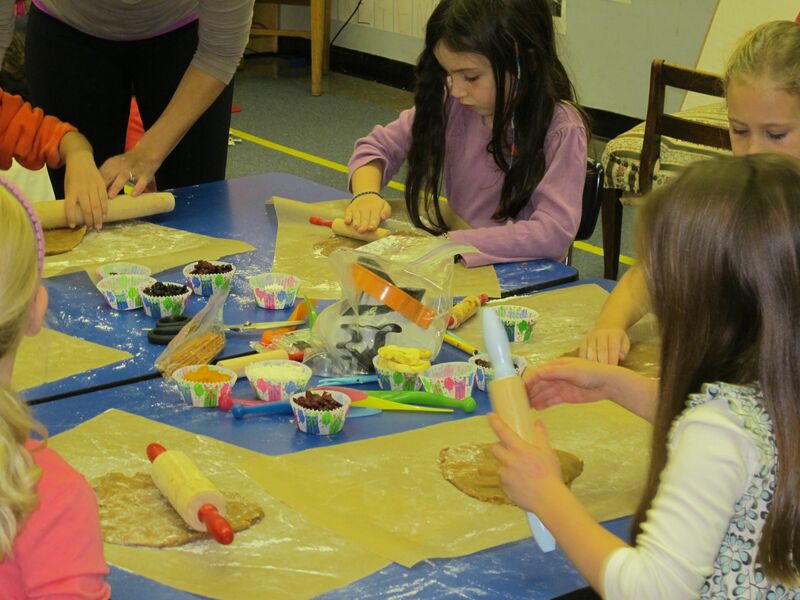 At this point in the year, choice time lasts from 45 minutes to an hour, including clean-up. It can go a little longer in the spring when we are in the middle of our transportation and bridge study. At the beginning of the year the centers are very simple to set up and put away and choice time only lasts 20 or 30 minutes, including clean up. Children make their center choices first thing in the morning during a short “welcome time.” I keep track of where children go on a chart and they are required to choose a different center each day. In this way, children get to experience all of the center activities at the start of the year. Sometime in October, I remove that restriction, but I continue to record where they go so that I can keep track of their interests (this is important information to relate to parents at the first conferences). In November, I begin “block teams” that sign up on Monday for block building and remain there for the entire week. Thursday becomes their day to share what they have built with the class and Friday becomes “clean-up day.” As an incentive to cleaning up before the end of the period, I offer the group a box of Playmobile people and accessories that they can play with in the block center for the remainder of their time. 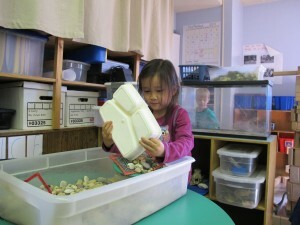 The toys are easy to gather and put away when its clean-up time for the whole class. I keep the unit blocks on the shelves and the odd shaped blocks in large tubs with pictures on the side to show where they go. There is a photo of the shelf unit with blocks all neatly put away for the children to look at on the wall. It’s remarkable how well they clean up what is often one of the most difficult centers to put away! Children are expected to stay in their chosen center for the entire period, but of course there is lots of cross-over activity. 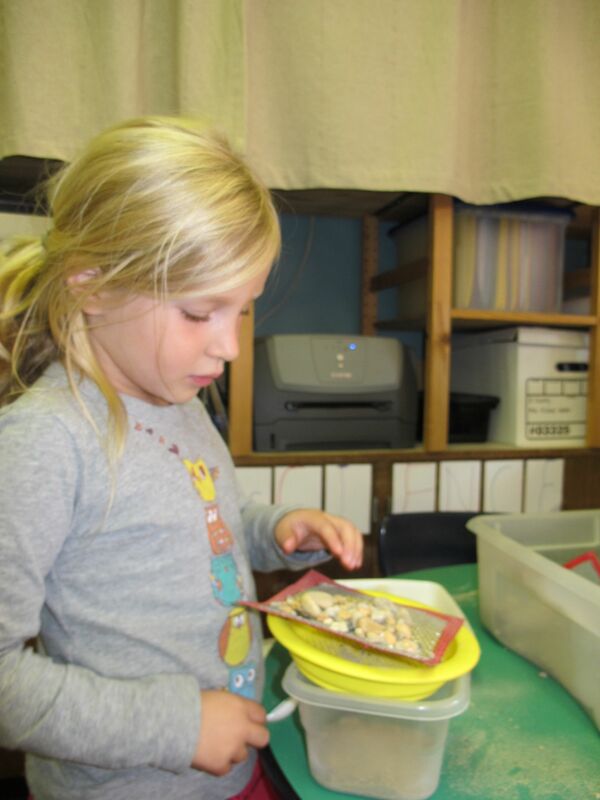 Children in the science area may become excited by a discovery and call their friends over for a look, or children in the writing center may decide to make letters for their friends and then seek them out for delivery. It’s sometimes noisy and messy, but I feel that choice time is the very heart of our day. It’s the stuff from which our classroom community grows. Thank you Renee. This one I admit makes me sad because it is not happening in enough places in our country. My granddaughter’s kindergarten had none of the above. And this also reminded me about how wonderful my master teacher’s room was – with all kinds of centers, including cooking that her student teachers organized. Only one teacher, about 15 years later when my daughter was in second grade, had as many interesting activities as Bill did, but never available at all times (which my master teacher was able to accomplish somehow). I often went in and volunteered to do the “cooking” but I used Thelma Harms’ cookbook which individualized the cooking experience. It took me all day to teach each child to make his or her own pizza from scratch. I loved this – and they learned so much from it. I am in mourning. Joan, let’s not give up on kindergarten (and first grade, and second grade…) The big problem aside from the crazies who are coming up with ridiculous demands on teachers and children, is that the young teachers don’t have any models anymore. What an amazing description of a Kindergarten classroom. I am a Kindergarten teacher–been so for almost 20 years–and love it. You are correct when you say that there are ridiculous demands being placed on K’s nowadays. Still, I am going to try to incorporate bits and pieces of this approach into my classroom. The pendulum is going to have to swing back at some point and I think that approaches such as Reggio are going to be very popular. So glad I found this article!